1) Nobel Prize in Economics 2013: Nobel prize for economics 2013 was awarded to three American economists for their finding a way to predict prices of assets like stocks and bonds. 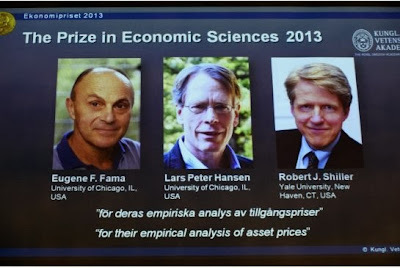 The Royal Swedish Academy of Sciences said the award in 2013 was about predictions and hence decided to give the Sveriges Riksbank prize in economic sciences in memory of Alfred Nobel for 2013 jointly to Eugene Fama and Lars Peter Hansen from the University of Chicago and Robert J Shiller from Yale University. 1) Cyclone Phailin hits 90 lakh people, destroys crops worth Rs 2,400-cr: Cyclone ‘Phailin’ today left a trail of destruction, hitting nearly 90 lakh people, damaging over 2.34 lakh houses and laying waste paddy crop worth about Rs 2,400 crore. 2) East Coast Railway resumes train services in Odisha: With the situation improving in the aftermath of Cyclone Phailin in Odisha, the East Coast Railway today resumed train services and ran some special trains to carry stranded passengers. 3) Death toll in MP stampede reaches 115: Death toll in the stampede during Navratri festivities near a temple in Madhya Pradesh's Datia district climbed to 115 on Monday. 1) Vietnam is evacuating tens of thousands of people in the path of Typhoon Nari, state media said today, after the powerful storm left 13 dead in the Philippines. 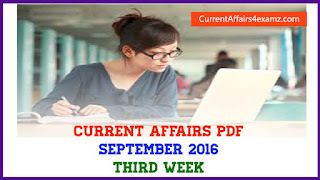 2) China’s inflation rises to 3.1% in Sept: China’s consumer price index (CPI), a main gauge of inflation, rose 3.1 per cent year-on-year in September, up from 2.6 per cent in August, while its producer price index (PPI) fell 1.3 per cent for the same period amid decline in exports. 1) Serena Williams of the United States maintained a huge lead atop the wakhistan omen’s tennis rankings issued on Monday. 3) India’s campaign at the World Boxing Championships being held in Almaty, Kazakistan got off to a disappointing start as Madan Lal (52kg) went down in the first round itself. 4) Australian Terry Walsh is set to be appointed as head coach of the Indian men’s hockey team after the Sports Authority of India recommended his name to the Sports Ministry. 1) Former Union minister, freedom fighter and environmentalist Mohan Dharia, who quit the Indira Gandhi government against imposition of Emergency, died here today of chronic kidney failure. He was 89. 2) Oscar Hijuelos, a son of Cuban immigrants to the U.S. whose 1989 novel "The Mambo Kings Play Songs of Love" made him the first Latino to win the Pulitzer Prize for fiction, has died. He was 62. 1) ING Vysya Bank has entered into a business tie-up with Indian Railways’ IRCTC to offer online train ticketing services to its customers. 2) Muthoot Finance gets ‘Golden Peacock’ award: Gold loan company Muthoot Finance Ltd has been bestowed with Golden Peacock Award for ‘HR Excellence for 2013’ at a function in London. 3) IRCTC asked to pay Rs 25,000 for not refunding fare: IRCTC has been directed by a consumer forum here to pay Rs 25,000 as compensation to a passenger for not refunding fare of his unused wait-listed tickets booked nearly three years ago.